Linford Manor Park Visitor Mooring is a place on the waterways minor waterways place place on the waterways major waterways place village town city on the Grand Union Canal (Grand Junction Canal - Main Line - Gayton to Brentford) between Great Linford Railway Bridge No 76A (disused) (2½ furlongs to the west) and Bridge No 78B (Grand Junction Canal) (7 furlongs to the southeast). The nearest place in the direction of Bridge No 78B (Grand Junction Canal) is Linford Winding Hole; 1 furlong away. This is a 48h. 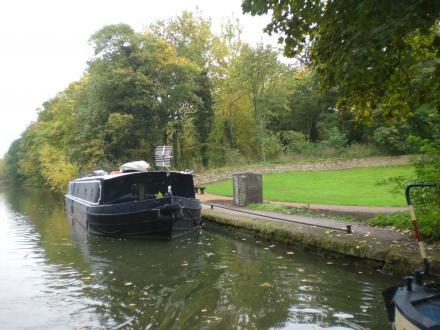 Parks Trust mooring and there is a £50 per night penalty for overstaying. 30 High Street Great Linford, Milton Keynes, MK145 — 334 yards to the south. 136 redbridge, Milton Keynes, MK142EW — 1524 yards to the south. M1 Motorway Southbound, Junction 1415 Newport Pagnell, Welcome Break, Newport Pagnell, MK16 8DS — 1369 yards to the northeast. M1 Junction 1415, Newport Pagnell, MK16 8DS — 1383 yards to the northeast. M1 Motorway Southbound, Milton Keynes, MK16 8DS — 1418 yards to the northeast. Btw Jct 14 & 15, M1, Newport Pagnell, MK16 8DS — 1440 yards to the northeast. Santa Cruz de Tenerife — 1590 yards to the northeast. 147 Hainault Avenue, Milton Keynes — 1356 yards to the southeast. 899 yards to the southeast. Lower Stonehayes,Great Linford, Milton Keynes — 1304 yards to the southeast. Newport Pagnell — 1617 yards to the northeast. 7 Knebworth Gate, Giffard Park, Milton Keynes, MK145QD — 1014 yards to the east. barbury court, Milton Keynes, MK14 5PT — 1538 yards to the southeast. Milton Keynes — 1421 yards to the southeast. Blakelands, Milton Keynes, MK14 5HS — 1319 yards to the east. Newport Pagnell Motorway Services, Newport Pagnell, MK16 8DS — 1353 yards to the northeast. Great Linford — 794 yards to the southwest. Wolverton Road, Great Linford, MK14 5AH — 442 yards to the northwest. Newport Pagnell, MK16 8DE — 1637 yards to the northeast. Wood End First School, Stantonbury, Milton Keynes, MK14 6BB — 1417 yards to the south. 7 Lodge Gate, Great Linford, MK14 5EW — 1124 yards to the south. 38 Tanners Drive, Milton Keynes, MK145 — 1370 yards to the east. Newport Pagnell — 1342 yards to the northeast. Parklands, Milton Keynes, MK14 5AU — 375 yards to the southwest. Milton Keynes — 1564 yards to the southwest. Great Linford MK14 5DZ, Milton Keynes, MK14 5DZ — 267 yards to the east. Home, Milton Keynes — 1294 yards to the west. M1 Northbound, Milton Keynes, MK16 8DS — 1418 yards to the northeast. Milton Keynes — 1363 yards to the south. Milton Keynes — 1586 yards to the south. Jct 14-15 - M1 Northbound, Milton Keynes, MK16 8DS — 1266 yards to the northeast. Pipard, Milton Keynes, MK14 5DF — 1082 yards to the south. 1367 yards to the southwest. Silverstone — 1320 yards to the north. Great Linford, Milton Keynes, MK14 5EF — 283 yards to the southeast. Milton Keynes — 375 yards to the southwest. 1457 yards to the east. 892 yards to the northeast.